“Maria Thermann’s novella is a traditional Victorian ghost story with a spoonful of romance thrown in for good measure. Set towards the end of the 19th century in the fictional county of Oxtailshire, the novella takes a humerous look at the genre and hopes to entertain, rather than scare readers. Furious about his son’s choice of wife and occupation, Sir Hubert Tulking, life-long enthusiastic hunter of foxes, decides to take drastic measures, when his son Allan returns to England to introduce his American actress wife to the county set. The brazen fortune seeker must die! Just one minor problem: Sir Hubert isn’t exactly in a position to wring the lady’s neck…for he himself died a year ago in a riding accident. How can a ghost exact vengeance? Sir Hubert leaves no stone – or ancient book – unturned to find an answer! Still grieving over the death of his young wife, Roderick, Marquess of Tumbleweed, throws himself into his work and follows his passion: fox hunting. He runs a successful Hunt from his estate, but fails to engage on a personal level with anyone other than his childhood friend Sir Alan Tulking. Even lonelier after his friend departs for Broadway and the career of playwright, Roderick is delighted when Sir Allan announces his return, but horrified when he discovers a ghost is out to destroy his friend’s new-found happiness. Will Roderick be in time to save the new Lady Tulking from a gruesome death at the ghostly hands of Sir Hubert? Matters are complicated even more, when Roderick finds himself pursued romantically by author Beatrice, who won’t stop at nothing to ensnare Roderick and promote her new novel at the same time. She’s one cunning little vixen and the Marquess of Tumbleweed had better watch out or the Master of the Foxhunt will become the prey. Where can you get this delicious slice of romantic Victoriana in time for Valentine’s Day? How the story came about and what inspired both story and book cover you can discover on my Stories from the Hearth blog: the most recent blog post explains the Landscapes of my Mind! What’s it about? A while back I decided to start a whole series of books on “creatures of the night” and, as a life-long devotee of ghost stories, I began the series with “The Little Book of Halloween” and “The Little Book of Ghosts”. The concept is to present a blend of 70% non-fiction and 30% fiction, with fun and educational facts about the main topic, followed by two or three short stories inspired by the creature of the night or paranormal/supernatural topic. I’m not applying the concept of the 70/30% split too rigidly. “The Little Book of Halloween” for example has only two longer short stories, while “The Little Book of Ghosts” will have 3 shorter short stories (around 2,000 words each). I wanted to inject something of “myself”, or rather my cultural background into each book, so there will be stuff on Germany’s haunted houses and German folk tales about ghosts. There are mainly stories that originated in the North of Germany, most notably in my home town Luebeck, a UNESCO World Heritage Site and birth place of the Hanseatic League that dominated European trade in the Middle Ages. The Halloween-related book will have many fun facts about pumpkin growing competitions in Germany and what German children say when they knock on doors with their version of “trick or treat”. Naturally, there will also be pumpkin-growing tips and pumpkin-related recipes, as well as general information about the origins of Halloween and what people got up to centuries ago on the night of All Hallows Eve. Halloween wasn’t celebrated at all in Germany, when I grew up there. It wasn’t until the mid-1990’s that this fun autumn festival gripped the nation and is now celebrated widely across Germany. There will also be a brief overview of the creatures of the night that people most commonly dress up as. What about vampires and werewolves I hear you cry! Don’t they deserve a book all of their own? Of course they do! Willow the Vampire and her brand new sister Flora Fangs would never forgive me, if their species were to be left out. Already, I am collecting fun facts about vampires, real ones (fleas!) and supernatural ones, for a future book, which as you may have guessed, will be “The Little Book of Vampires”. Next up in the series is then “The Little Book of Witches”, which should be amazing, since I found a huge amount on witchcraft, witch hunts and trials, not to mention witch museums in haunted castles where the ghosts of murdered women won’t let anyone visit for fear they might end up also being tortured and burned as witche s! I am also working on an ebook with a collection of short stories aimed at an older audience. It’s entitled “Love at First Bite”; a while back I answered the call of a Bookrix.com member for competition entries and, as the theme was “first date with a vampire”, I wrote a short story about a blind date between a vampire and a human. It was so much fun that I thought, why not create a whole book of this, each story based on a different deadly critter? If you want to read the vampire story, which is set in London in the 1920’s, you need to sign up (for free) to Bookrix, where I’ll be gradually adding to the ebook I have created for the “Love at First Bite” short story. It’s a free download for Bookrix members. duly delivered! She tells me she’s putting the page together, so just be patient. In case some of you fall in love with the illustration she did for my http://www.inkitt.com/stories/23849 entry and want to commission some art work for a book cover for example or illustrations for a picture book: please form an orderly queue…We are not only working on an Early Reader’s book (for my Flippety Floppet series) but are currently pondering on a picture book for Willow the Vampire, set when Willow was a lot younger and still at Vampire Infant School in London. Watch out for one snappy little critter called Flora Fangs! 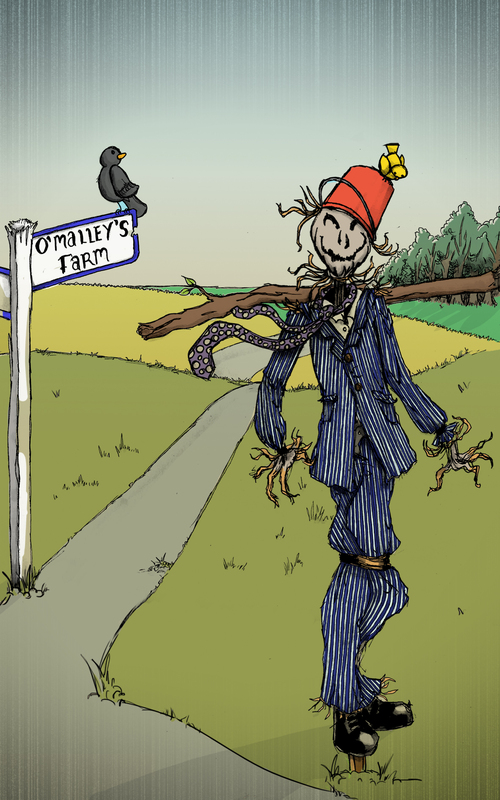 Back in rural Lincolnshire, 9-year-old Linus Brown discovers he gets more than he’s bargained for when he takes the advice of a mysterious scarecrow and chooses a road less well travelled on…things take a rather unexpected turn for shy Linus. Did I mention there are witches and any number of jokes about farting littering my Inkitt entry? Be careful when wandering into Linus’s world though, or you might step accidentally on a few leprechauns with your size tens. Thunderpants-a-go, please LOVE and VOTE for the story, if you like it and FORWARD to as many creatures of the night as you can think of. Thank you. …Neobooks(dot)com, which is affiliated to one of Germany’s most respected publishers. Unfortunately, the site doesn’t seem to be available in English, which will cause problems for the non-German language indie authors among you, but when I emailed Neobooks a while back they assured me they do support literature of other languages and they do accept authors from other countries. Your book will not just be listed and sold by the biggest ebook retailers in the world – including Amazon.de, Buch.de, Kobo, Der Club/Bertelsmann, Buecher.de, Google Play, Ciando.de and Apple iTunes – but will also cover the entire German-language book market, as they sell into Switzerland and Austria also. These are the heavy-weights of ebook sellers in Europe, so if you’re thinking of publishing your vampire, fantasy or non-fiction book on bats as an indie author, don’t be put off by the German language aspect of it. All of these retailers sell English language books. Covers: According to the blurb on the site, it looks easy to upload cover designs (which need to be 1,400 pixels wide min). Text: All headings for chapters must be set to Header 1/Header 2 etc in order for them to translate properly into epub readers apparently – now would it not have been nice for other ebook publishers to tell us that? Grrr. Don’t bother adding one of those stupid “floating” tables of contents either, Neobooks do that apparently. The difference between publishing with Neobooks and say, Amazon Kindle or Bookrix, is that at Neobooks authors can go straight into a daily “most liked/most read” type competition that could easily bag them a traditional publishing contract with Droemer Knaur Verlagsgruppe, which incidentally is working in cooperation with Rohwolt Verlag on this venture. These are two of Germany’s, and therefore Europe’s, most prominent, respected and powerful publishers of fiction and non-fiction. They feature heavily at all the big book fairs, inc. Frankfurt Book Fair and New York’s book fair. And the partner list of Neobooks also makes for impressive reading: Leipzig Buchmesse (Leipzig Book Fair) is only one of THE biggest book fairs in the world and I think the second largest in Germany after Frankfurt Buchmesse. ZDF stands for one of Germany’s largest and most prominent TV channels. I don’t have to explain to magazine readers or men and women of the WordPress world who or what Stern.de stands for, do I? If Neobooks accept your manuscript on their site for ebook publication and you put the time in to promote your book/s, you stand a good chance of not only making book sales but getting proper literary respect from your peers, publishers, readers and critics. They have nurtured a large number of authors who since then have become bestsellers. The site encourages reviews and acts as a useful resource with lots of excellent tips how to protect your work. If you were looking for an outlet for your translated manuscript, this could be the one for you; you’ll just need to borrow/hire a German speaker to help you with the set-up and upload. I’ll report back when it’s done. Incidentally, all my uploads into Bookrix (dot)com have now been made available at the retailers they work with. It took about a week, no more, before all was up for sale. Pretty good, bearing in mind that with traditional print publishers it can take up to 2 years before a book sees the light of day. Please stop by to leave a review if you’ve got the time…and give us a howl, if you cannot make sense out of uploading with Bookrix. No, I’m not talking about myself here! Although, admittedly the image staring back at me in my mirror could do with smoothing out, peeling off the old and pasting on a younger, fresher smile once in a while. At least you still have a mirror image, I hear the vampire enthusiast among you cry. You are right, one should always be grateful for small mercies in life and after-life. 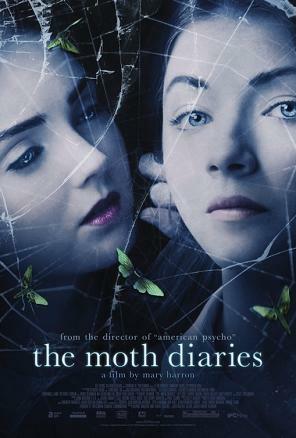 Actually, my comment about being a bit moth-eaten around the edges was aimed at the movie “The Moth Diaries” which I finally got around watching last weekend when I wanted a break from writing chirpy travel articles about Spain and Portugal. Although I’m not strictly saying that the film was boring – far from it – it just took such a long time getting round to what it wanted to say that I was tempted to shout “aren’t we there yet” at my laptop screen, like an impatient child sitting in the back of a car on her way to Harry Potter World. I liked the moth element of this supernatural tale, which of course was chosen because it mirrored the protagonist’s happiest childhood memory; only the vampire knew how to twist and pervert this life-sustaining memory into something deadly and morbid. 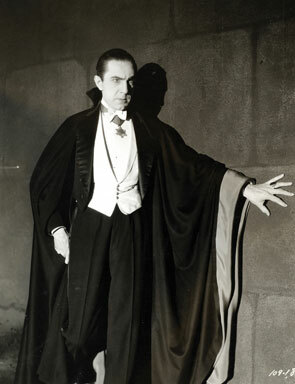 What I found interesting was the fact that this supernatural caper went back to the pre-Dracula days in the vampire genre when vamps where emotional life suckers rather than the blood-slurping variety. These are, of course, the type of vampires one is more likely to encounter in real life than the fangy Count D.
It made me think back of my school days and how certain types of people simply cannot bear to see others being friends or lovers without wanting to insinuate themselves into the middle and sucking the life out of that relationship. Oddly enough, elements of the Transylvanian school of thought, as I call the emotional life sucker folklore, will be creeping into my 2nd Willow adventure too, although for the moment I have put this to the backburner to finish another book. 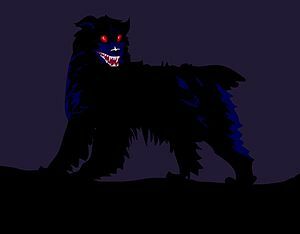 How do you prefer your creatures of the night? Biting with gusto into a throaty, full bloodied adventure or wheedling their way into the heart of the matter like a sly maggot? During research for one of my WIPs I came across this lovely book “Faeries, Elves and Goblins – The Old Stories” by Rosalind Kerven, a National Trust book published under their Folklore banner. It not only has beautiful illustrations by Arthur Rackham and other acclaimed artists but also contains a very interesting collection of stories and a wealth of information about the Little People living under hills, in meadows and ancient groves. I had never realised how wicked some faeries, goblins and elves could be – just read King Herla’s story or the plight of poor farm boy Tom Tiver, when he meets goblin Yallery Brown, and you’ll know what I mean! Not all of these nightly creatures are wicked though and some are rather helpful to humans, provided said men, women and children are deserving of their magical interference. I also didn’t know how many different kinds of faeries existed in the folklore catalogue of mythical creatures populating the British Isles – there’s a veritable legion of them. Thanks to J K Rowling we all know about Cornish Pixies, and if you aren’t friends with Hermione Granger it’s probably not a good idea to invite a Cornish Pixie into your house for tea. But did you know there were pixie populations in Devon and Somerset, too? Would a Devon Pixie have a different accent than a Cornish one? Would a Somerset Pixie offer you a pint of scrumpy if you asked nicely? Do you know what a Greenie or Grey Neighbour is or have you ever come across Henkies, Hobs or Hogmen before? Hands up, who’s heard of Phynnodderees, Portunes or Trows? Ever come across the Siofra, Spriggans or Grogachs after a particularly boozy night out? I’m especially intrigued by the stories that mention faerie folk living under hills and mountains, for it ties in with my research on Arthurian legends – not the medieval 12th and 13th century romantic versions we usually get to see on telly or on the silver screen, but the “real” 6th century AD legendary King Arthur and Merlin characters mentioned in various historical documents (which may be fictional accounts and not about real people at all but hey, us folklore fanatics take what we can get). To me, faeries belong to the Dark Ages, the time when the Romans had left the British Isles and Britons had to fend for themselves – and according to legends, Arthur and Merlin were probably the last remaining defenders of the Celtic way of life, before the invading Saxons and their nasty new-fangled religion destroyed the magic that had once permeated every aspect of Brythonic life. King Herla’s story in particular stands out – it’s almost as if the storyteller is referring to the Romans, making them faerie folk who promised a land of golden opportunity, patronage, friend-and kinship and then simply vanishing into thin air. So if you want to learn more about these mischievous creatures of the night, these laughing, chanting, giggling dancers and musicians with their gem encrusted halls, their faerie gold and silver bells, their colourful clothes and strange sense of humour, have a peek at Rosalind Kerven’s book. It’s perfect night time reading material. Throughout history unusual features in the landscape have sent human imagination into overdrive, spawning legends, fairy-tales and myths. I’d like to use the next couple of blog posts to investigate this super-charged landscape issue a little further. My first candidate for natural phenomena are Hohlwege, the German word for well-trodden paths that have literally been hollowed out by generations of feet, hooves and paws as well as by rain and wind, taking several centuries to mature into their creepy and myth-inspiring selves. 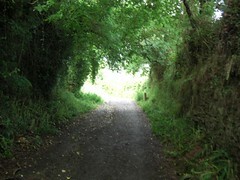 Such footpaths lead through fields, forests and mountains and typically connect ancient market towns and places of worship and are usually found close to popular pilgrim routes. So close your eyes and imagine you’re on your way to a medieval market to sell your farm produce. Turnips, onions and beets anyone? Travelling through Germany’s Mecklenburg in your top-of-the-range oxcart, you’ll come across a forested area called Hohenzieritz Woods, which sits in spooky silence between the towns of Penzlin and Hohenzierlitz. The ancient Iserputt footpath or Hohlweg snakes through the wood, where it leads overgrown and hollowed out by the weather, with deep and muddy cart tracks left by a hundred generations of market traders just like you and your team of pretty oxen, to the nearest place to sell your wares. Make haste and drive on your team of oxen, for at midnight twelve gleaming white men carrying a black coffin will appear out of nowhere and they just might select you as their number thirteen! We can only imagine with what urgency travellers raced along the Iserputt path, their sandals flying over sticks and stones, their feet splashing through mud-filled puddles and their heads full of ghostly apparitions out to get them for whatever sin their superstitious medieval minds could conjure up! Another legend has it an old man on a cart travelled on this path in the middle of the day. Without warning, the cart came to a halt and his horses refused to take another step. The old man got off his cart and went to investigate the source of the delay. He found a tall, black figure on the back of his cart, laughing wildly and terrifying the horses. The old man was furious to have a stranger mocking him, so he whacked the apparition with his whip. To the old man’s surprise the apparition disappeared and his horses took him and his cart from that place as fast as their hooves would go. Ghosts, as one rather rude and ignorant blog reader informed me the other day, “do not exist, you idiots”. I dare to disagree! They may not be Caspar and Co. zipping down the corridor in some abandoned mansion or the Ghost of Canterbury having a score to settle with a new set of occupants, but ghosts are likely to exist in our traditions and belief systems we inherit from our forbearers and that makes them very real to us. As long as humans believe in a soul surviving death, there will be talk of ghosts…they exist in our minds because they might represent our guilty conscience of unfinished business with the dear departed or our longing to see loved ones again or simply express our own hope that there’s life after death despite scientific proof that we’re just ending up as worm fodder. 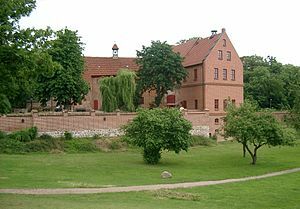 Imagine you’re an uneducated peasant working the fields surrounding Castle Penzlin in Mecklenburg, bringing in your hay in medieval Europe. 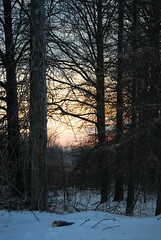 The drudgery of day-to-day life must have been unbearable for an intelligent, but uneducated person of the lower ranks. How better to while away the time while making hay than to invent little stories about the things that occur in our surroundings – natural or supernatural phenomena, if that’s what you believe. When we see mist rising up from the heated soil after a long, hot day in summer is cooled down by sudden rain, we can easily imagine ghostly spirits are leaving the ground in protest. Morning mist swirling upwards and gathering in clouds around the summits of hills and mountains, the wind changing and moulding their shapes into fantastical apparitions, are perfect candidates for souls rising up to heaven, while pea-soupers in historic towns are bound to be a demon’s breath robbing us of our sense of direction, trying to lure us into a trap. Naturally, I’m going to use this spooky landscape feature called Hohlwege in my upcoming novel Willow the Vampire and the Wuerzburg Ghosts. Are there any mysterious features in the landscape near you that might inspire a ghostly tale or two?